Garbage. Old mattresses and furniture. Concrete: the alleyway backing my house. As a kid growing up in Vancouver, I spent a lot of time playing with neighbourhood kids in the alleyway outside our family home off Cambie Street. Most residential homes in Vancouver are backed by alleyways with garages located at the back of the house - this means no hideous, monstrous garages facing the street like in many suburban homes. 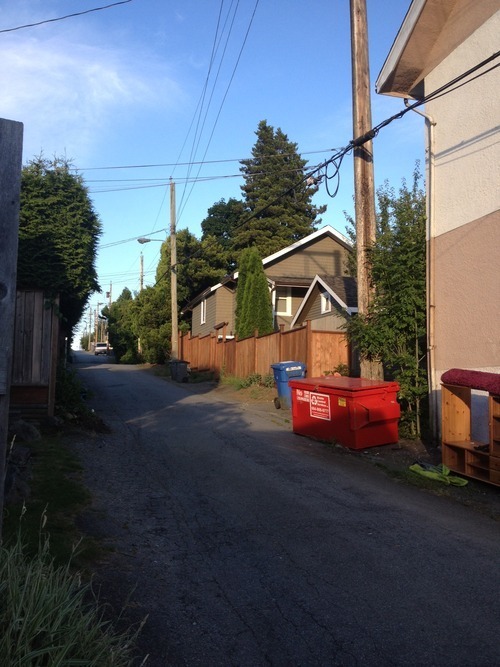 These alleyways are nothing special to look at, and are mainly used as service roads for garbage trucks and entry/exit ways to residential garages (although space is limited in Vancouver and most people park on the street - opting to use their garages as an extra room/art studio/man cave, etc.). I don't see as many kids playing in Vancouver's alleyways like my generation did - perhaps this is a result of helicopter parenting. But, a former experiment by the City of Vancouver could help neighbours find more common space to get to know each other. Asphalt paving was removed and replaced with "structural grass," rigid plastic honeycomb cells sprinkled with ordinary lawn seed and nurtured into green swaths. Concrete strips were embedded on two sides, creating a durable driving surface. Permeable brick pavers were installed in driveways and at the lane way entrances; these allow rain water to infiltrate between their joints and into the ground, reducing run-off, the bane of municipal storm sewer systems. The effect is both practical and pleasing to the eye. No more cracked and potholed pavements. Traffic on the countrified lanes continues, but motorists must slow down to navigate the concrete driving strips. The grassed lane ways are cooler than asphalt in summer and they don't emit the dreaded "off-gassing." They have also passed the test of time; they still look fine, almost bucolic. According to resident Mike Klassen, whose home backs one of these country lanes, it has brought together his east side community. Neighbours are expected to maintain the space. "It's not a place where people feel they can dump their old couches and garbage," he says in the National Post. "It became a gathering place for many us over the summers. We've held barbecues there." Imagine if today's alleyways all looked like this, backed by increasingly popular laneway homes and garages converted to artist's studios or wo/man caves ;), with children meeting from around the neighbourhood to play. In one of the world's most expensive cities where space is at a premium, alleys serving as country lanes would be a much more effective use of space than the current single-purpose, service lane for garbage trucks and cars. Around the world, more cities are finding creative ways to convert laneways as street markets, performance spaces, art exhibitions and more. 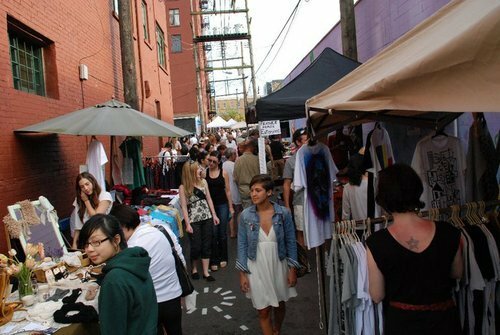 Vancouver even has a non-profit organization, Livable Laneways, that is dedicated to transforming the overlooked laneways and alleys of Vancouver into pedestrian-friendly civic spaces. 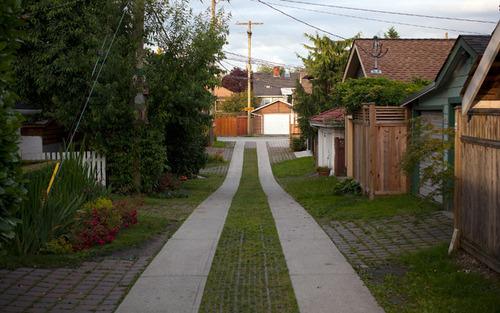 With all this focus on reimagining laneways, it seems a fitting time for Vancouver to revisit its Country Lanes program. Writing this article got me really interested in laneways. Next week I will look at successful laneway conversions around the world.